Here at Essentia we believe conferences are the most efficient way to spread the word about our mission. And not only that, it’s also a great way to keep in touch with our community. During the last few months, we have attended many events. We always enjoy hearing from the biggest names in the crypto industry, as well as introducing our own brainchild — the Essentia framework! For this reason, we have no intention of ending our attendance and sponsorship of the biggest events in the crypto-sphere. We want you to know where and when you can meet an Essentia team member and have a chat, so here we’ve prepared a little roadshow of the events, dates and exact places. Description: The conference provides two different sets of events for Investors; The first regarding Family Offices, Funds, Companies and Entrepreneurs, and the second, Senior Executives, Board Directors, and Business Leaders. The Rules of the Crypto Game at the Investment Stage. Speakers include: Tim Draper (Founder at Draper Associates), Michael Arrington (Founder at Arrington XRP Capital, Founder at TechCrunch), Vinny Lingham​ (Co-founder & CEO at Civic.com, Board Member at Bitcoin Foundation), Edith Yeung (Partner at 500 Startups (Greater China)), Bill O’Connor (Innovation Strategist and Founder of Autodesk Innovation Genome), etc. 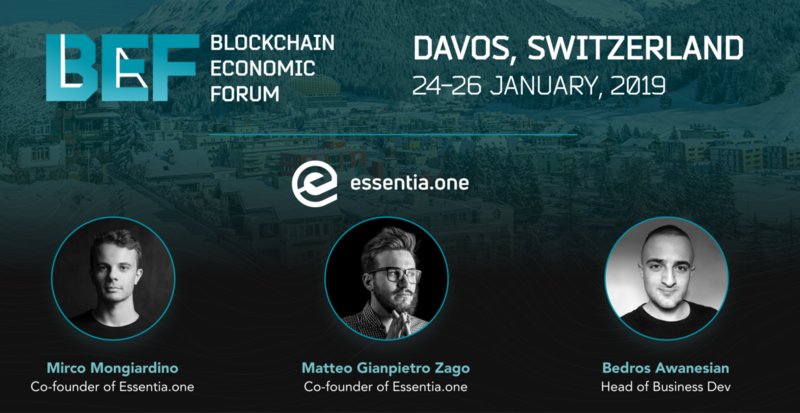 You will be also able to meet and listen to the speech of Matteo Gianpietro Zago, Essentia’s co-founder. 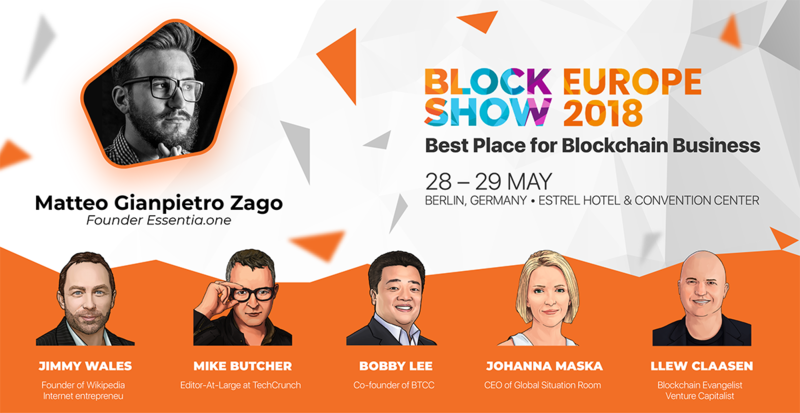 Description: This event offers key insights from renowned Blockchain experts, the opportunity to discover crypto-friends and learn about the most promising projects out there. Be sure not to miss Matteo Gianpietro Zago’s speech at the event! Description: The conference will gather entrepreneurs, thought leaders, investors, developers, academic and policy groups, and blockchain enthusiasts. The forum consists of a two-day program, with keynote presentations and panel discussions about major topics surrounding the industry. After the conference, on April 4th we will be holding an event - a free Meet & Greet in the WalkerHill Hotel. You will be able to have interesting discussions with influential people in friendly atmosphere. Do not miss your chance and reserve a spot. Update: We’ve posted a little photo report. Do not forget to check that out here. Description: Crypto Invest Summit is an exclusive event presented by some of the world’s foremost innovators. It attracts numerous talented people of crypto and blockchain technology companies, as well as service providers and investors who are ready to share their insights on the further industry development. Speakers include: Vinny Lingham (Co-founder, Civic), Kathleen Breitman (CEO, Tezos), Sam Goldberg (Co-founder, KR8OS), Al Burgio (Founder, DigitalBits.io), Crystal Rose (CEO, Sensay) Shashank Sripada (Founder/CEO, Bubblo), and so on. 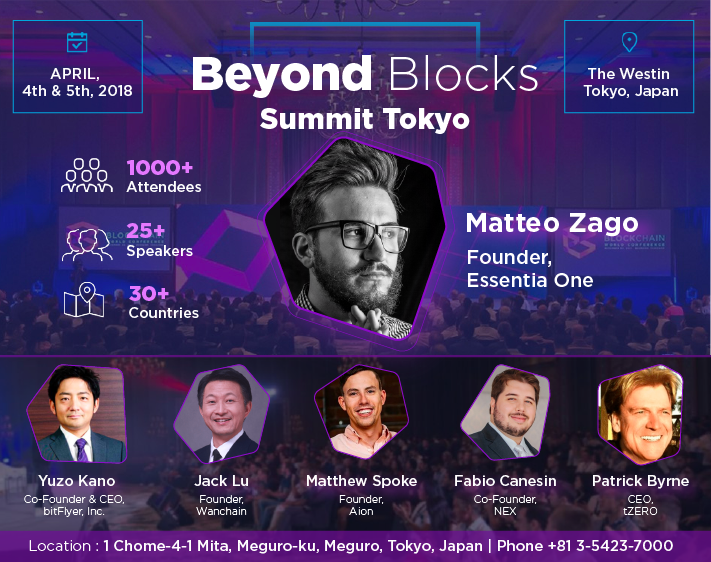 During the event you will able to listen to Matteo Gianpietro Zago (Essentia’s co-founder) ICO pitch, and to participate in the following Q&A session. Speakers include: Vitalik Buterin (Founder of Ethereum, Ethereum Core Researcher), Aya Miyaguchi (Executive Director of the Ethereum Foundation), Pandia Jiang (Founder of LinkTime), Gavin Wood (Founder of Parity&Polkadot, Cofounder of Ethereum), Joseph Lubin (Founder of ConsenSys, Co-Founder of Ethereum), etc. Essentia’s founder, Matteo Zago will also be present at the Blockchain Week in New York. The first event where you will be able to reach us is Consensus. We’ll be there on May 14–16. “Consensus is more than just a conference. It’s the largest and must-attend gathering of everyone involved in our rapidly growing ecosystem. We’re proud to partner with companies that continue to innovate and actively work toward taking their projects live,” — Kevin Worth, CEO of CoinDesk. The second event is Token Summit. “…we will continue to discuss the economics, regulation and best practices around blockchain-based tokens, protocols, and crypto-assets. Specifically, our focus is on Designing Token-Based Economies, and succeeding at creating value for users.” — they state on their website. It is a great opportunity to come up, say hi, discuss the events and ask all the questions that you might have. Speakers include: Ran Neu-Ner (Host at CNBC crypto trader show, the top 10 most influential people in the blockchain, and Essentia advisor), Bobby Lee (Co-founder of BTCC), Renqi Shen (Digital Asset Investor, Fenbushi Capital Investment Team, Partner at BlockAsset Ventures), etc. 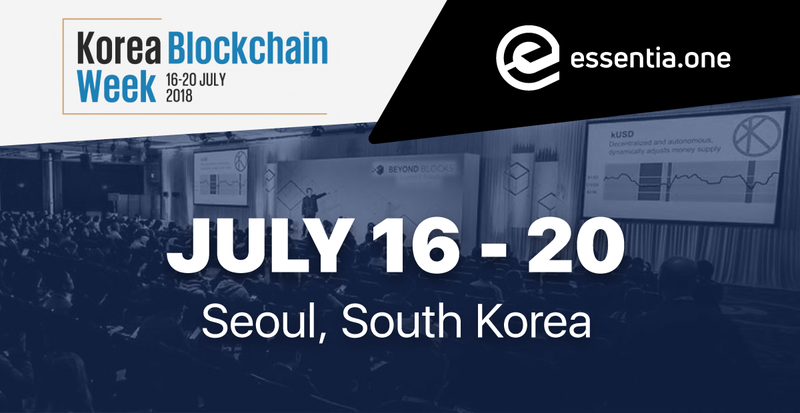 Description: Korea Blockchain Week and Beyond Blocks is Asia’s most prominent blockchain conference. Speakers include: Michael Novogratz (Founder & CEO Galaxy Digital Advisory), Jason Han (CEO Ground X (Kakao), Joshua Ho (Co-Founder QCP Capital, and Essentia advisor), etc. Description: Huobi Korea Carnival is a cryptocurrency dedicated conference hosted by the leading global digital asset exchange platform Huobi. The Carnival is a festival gathering blockchain experts and the most innovative project teams seeking for decentralization in one place. 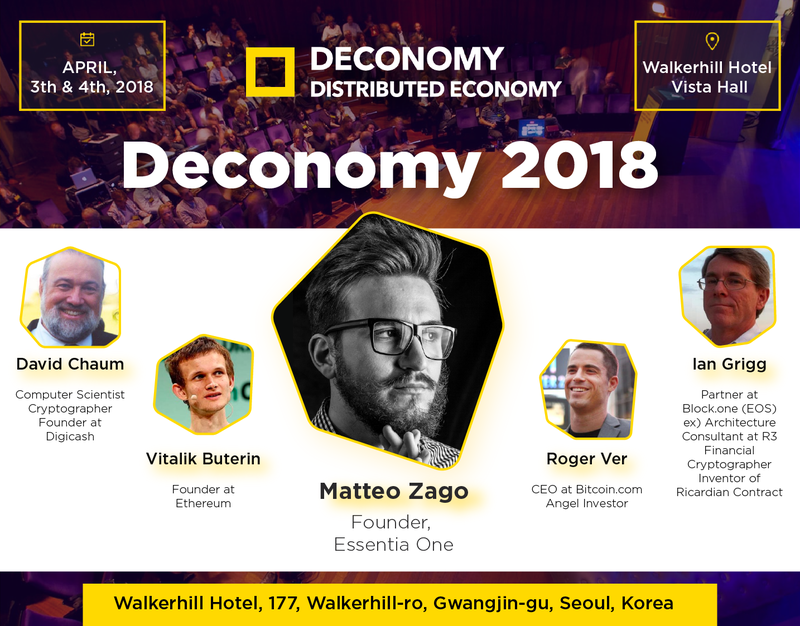 Speakers include: Roger Ver (CEO of Bitcoin.com), Guofeng Zhao (Chairman of Huobi Korea), Dong Zhao (Dfund Founder), etc. Description: #CRYPTOPARTY is one of this summer’s coolest events for investors, ICO projects and startups. At the conference, you’ll find hot crypto issues discussed, new acquaintances, friendly atmosphere and a lot more. Speakers include: Mark Ginsburg (Blockchain ideologist), Giorgi Sigua (Ex-head of Georgia’s trade delegation in Ukraine), Igor Poroh (Trader, analyst), etc. 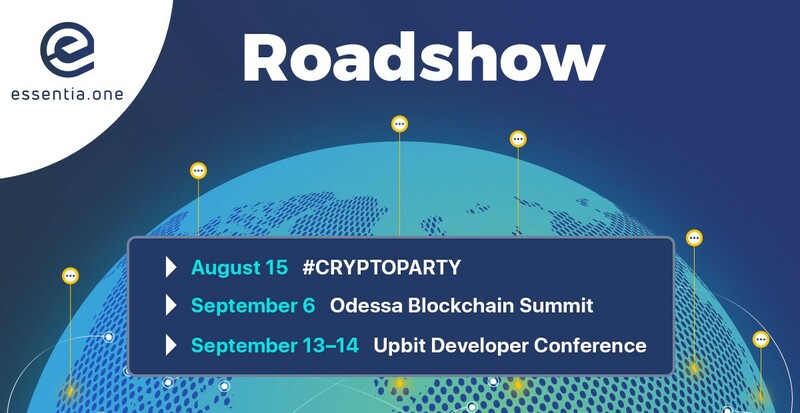 Speakers include: Igor Nikolaev (COO at Essentia One), Vladimir Omelyan (Minister of Infrastructure of Ukraine, Gennady Trukhanov (Mayor of Odessa), etc. 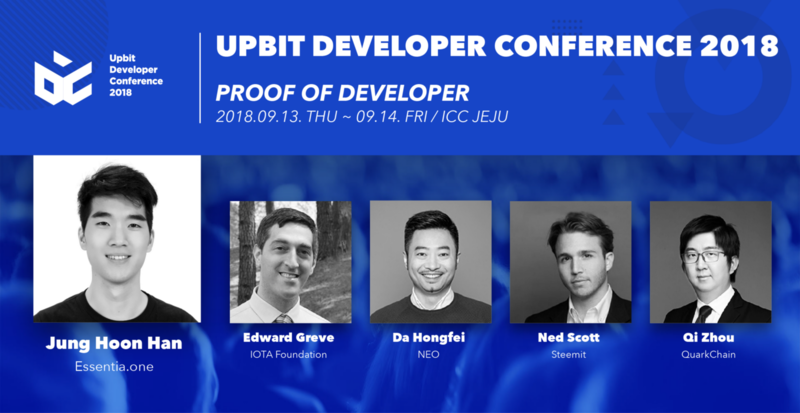 Speakers include: Ned Scott (Steemit), Edward Greve (IOTA), Da Hong Fei (NEO), etc. Speakers include: Vitalik Buterin (Ethereum co-founder), Joseph Lubin (ConsenSys co-founder) and Vinay Gupta (helped launch Ethereum). 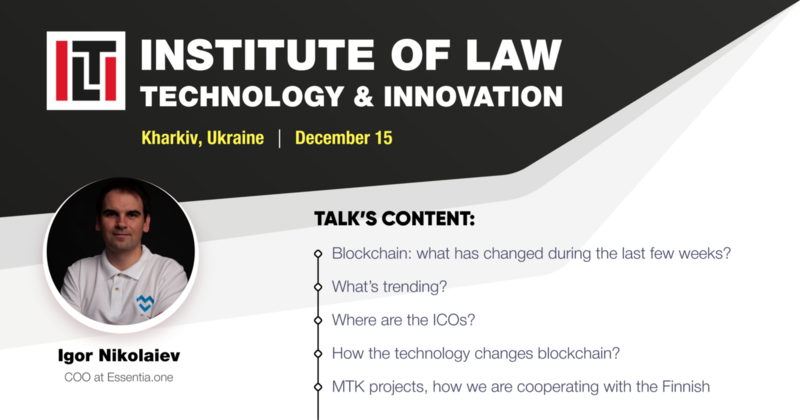 A meetup, where Essentia’s COO — Igor Nikolaiev — will be delivering a talk on the recent blockchain tendencies for the Institute of Law, Technology, and Innovation. Description: Blockchain Economic Forum comes back to facilitate the discussions of the most important topics of the crypto economy and its growing influence on the global economy. Speakers include: Vicente Fox (President of Mexico), Vinny Lingham (CEO at Civic Technologies), Bobby Lee (Bitcoin Foundation), and many more. We will keep updating the roadmap according to the schedule. Please refer back to the post for more information on the upcoming events. If you have any questions, suggestions or comments, don’t hesitate to contact us on any of our social media channels!